Think about the spacial settings of computer games (labyrinths, factories, castles, dungeons) and you could maybe, tentatively, argue that they’ve always, at their core, been about our relationship to architecture. This reading suits SLAB just fine of course, but Valve Software’s title Portal, is undoubtably fantastic encounter with the architecture of the imagination. 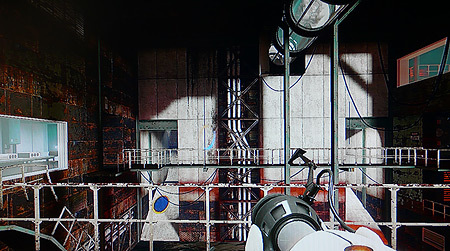 What makes Portal so completely mind-boggling is the way its developers have combined natural physical laws (such as gravity), with the stuff of science-fiction (wormholes) in a relatively familiar gaming surrounding (a sinister science facility). Portal rethinks space by rethinking weaponry. Instead of a gun, you are given a tool with which you can punch wormholes into walls, floors or ceilings. A kind of temporary, sub-atomic interaction with the architecture is the result. The principle is simple but the consequences are spectacular. Shoot with one hand and you make an orange hole, shoot with the other hand and you make a blue hole. The holes are connected, allowing you to enter one and exit from the other. A great way of crossing unsurmountable obstacles: don’t jump them, suggests the game, bend space/time around them. The player can also combine the wormhole principle with the effects of gravity: crossing a hole too large to jump can be achieved by shooting a hole in the wall behind you, then jumping into the hole and shooting a second hole directly into the floor below you as you approach it. Momentum then propels you over the top of the hole you just jumped down. 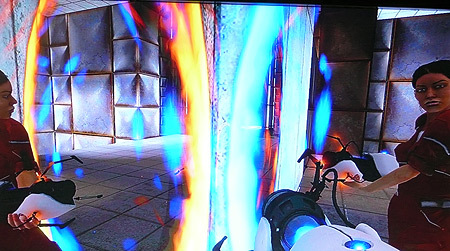 The portals also radically subvert the the first-person-shooter (FPS) game-genre by enabling the player to inspect their alter-ego as in a mirror by using two adjacent wormholes. 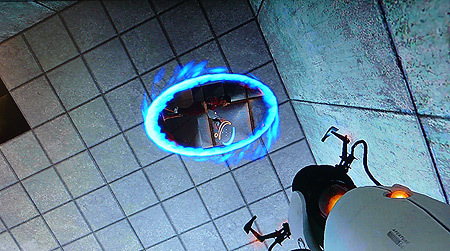 In doing this Portal also exploits the inherent coyness of the FPS-typical camera viewpoint, exposing the fact that you are actually playing a female character, still a rarity in this type of game despite Lara Croft. Joe McNeilly, senior editor of the online gaming journal Games Radar, has in fact written a lucent feminist reading of Portal in which he offers a Freudian reading of the portals whcih are Â«metaphorical birth canal through which the protagonist is constantly being born into new trialsÂ». Where Lara Croft blasts her way through Tomb Rader with a rich arsenal of weapons, Portal’s protagonist, Chell, makes subtle architectural changes to see her through. I urge you to read McNeilly’s article, and consider why such intelligent writing about computer games doesn’t appear in the mainstream architectural press. The disturbed geometries of the architecture are matched by the equally disturbed psychology of the gameplay. A malfunctioning computer (with a female voice) called GlaDOS taunts you from the off, offering dubious advice, and alternating between insult and praise for your actions. One recalls the dramatisation of Arthur C. Clarke’s HAL9000 in Kubrick’s 2001: A Space Odyssey, but also more recent films such as the disturbing but not quite so satisying Cube, in which a group of people wake up in a nightmarish architectural puzzle with no recallection of how they got there. I’m no expert in gaming, and I don’t own a games console even though Portal is as good a reason as any to do so. But I’d like to know if there are any more games out there treating architecture not just as a dumb backdrop, but as an integral part of game dramatology. As I’ve coming to understand it, Portal’s makers, Valve, are responsible for the game Half-Life 2 in which a Â«gravity gunÂ» comes in to play. This is what I’m after, physics-busting, architecture-warping, wormhole-pimped fractal geometry in a gaming environment inspired by M.C.Escher.